It is a truth universally acknowledged that geology is by far the hardest topic to make interesting in popular science. We're fine when it comes to stories of some of the characters of geological history, but as far as the geology itself, it's difficult to get excited. So what better way to raise the interest levels than to move your geology* into space? This is what Natalie Starkey does in Catching Stardust. But does it work? 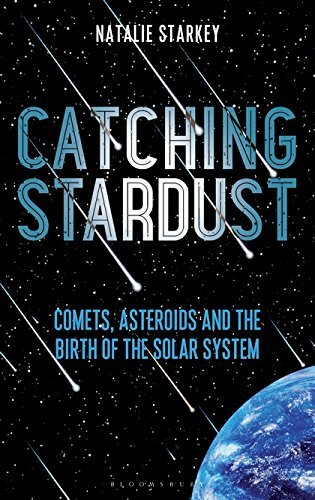 The main focus of Catching Stardust is comets and asteroids. What they are, where they came from, what they're made of (lots about what they're made of) and their (literal) impact on Earth from potentially supplying water and amino acids to the destruction of the dinosaurs to the possibility of us getting a major strike in the future and what we could do to prevent it. There's certainly plenty to interest us here, and though the focus is primarily on those space objects, Starkey gives us a fair amount on how the Earth and the Moon formed - in fact, the whole solar system - not limiting the content to asteroids and comets. In doing so, she introduced the most tautly stretched analogy I've come across in a long while. The solar system is compared to a city 'with the different parts of it as neighbourhoods.' It's difficult to see how this analogy helps understand anything, especially when we read, for example that before the planets formed the solar system was a swirling cloud of gas and dust: 'If we want to draw on the Solar-System-as-a-city metaphor here, we can think of this as the peaceful and luscious green countryside existing before our metropolis was built.' Well, not only does a swirling cloud of gas and dust have a limited resemblance to anything green and lush, the metropolis isn't made out of grass. The approach doesn't help, but luckily it peters out after a while. Where Starkey is at her best is when she is talking about space technology. For example, her description of the use of dust collectors at high altitude to collect space dust, of the various missions to asteroids and comets (who could forget plucky Philae?) and in considering the possibilities and pitfalls of space mining. In these sections, the writing really comes alive. Unfortunately, more than half the book focuses on the geological aspects of asteroids and comets and the Earth and so forth. And, sadly, here the curse of geological popular science is fulfilled. It is tough going, not helped by an overload of the academic tendency to want to be very precise and give lots of details that don't help get the story across. These sections simply lack any narrative drive - there's little to latch onto if you don't have an abiding interest in geology. This lack of storytelling is compounded by the way information is put across. Take a section where Starkey spends a couple of pages talking about the way labs work. Useful for us to know, but described in far too general terms. So we get: 'There are many, many possibilities for the further analysis of IDPs [interplanetary dust particles - she uses acronyms a lot], depending on what exactly needs to be investigated to answer the scientists' queries.... The work a scientist can achieve is usually very much dependent on the budget constraints of the laboratory they work in, as this controls what scientific equipment is available to them... When a scientist establishes that further laboratory investigations are required on a sample, for instance to test a new hypothesis, but they don't have the right equipment available in their laboratory to carry them out, they will often aim to collaborate with other scientists...' It feels more like an undergraduate essay than a book. If comets and asteroids are of interest to you, I don't want to put you off. You will certainly gain a considerable amount of knowledge from Catching Stardust. But the NASA representative who describes this as an 'action-packed narrative' on the back needs to get out more. * Strictly, since 'geology' is literally about the Earth, this is probably an oxymoron.